Nothing beats the pleasure of eating plump, ripened fruits picked fresh from your garden. It can be so frustrating, when after months of tending and nurturing the plants, the birds get there first. That’s why many gardeners choose to invest in fruit cages. Designed to withstand the great British weather, our galvanised steel and aluminium fruit cages are built to stand the test of time. 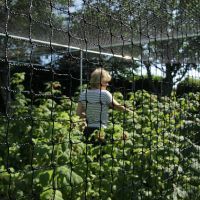 Using heavy-duty, UV stabilised polyethylene to make the nets, this material retains its shape for many years and won’t deteriorate through prolonged exposure to sunlight. For their strength and anti-rust benefits, we make our frames using a combination of galvanised steel uprights and lightweight aluminium doorframes and crossbars. Simply tell us your chosen dimensions and we will deliver your custom-made, galvanised steel and aluminium fruit cage (flat-packed) right to your door! For information on how to assemble our fruit cages, please view the fruit cage assembly guide. Click on the price list below to download a printable PDF. To choose your required size, simply click on select options. Fruit cages are one of the most humane ways to protect your fruit bushes and vegetables crops from bird or animal damage.